The highly anticipated blockbuster "Star Wars: The Last Jedi" opened late Thursday night, and as expected, fans were eager to be among the first to see it. It’s the second film in the sequel trilogy. The first, "The Force Awakens," is the third-highest grossing movie of all time. At the AMC Mercado 20 in Santa Clara, more than 200 people lined up to get the best spot to a showing. The person in front, Beejay Enriquez, took a vacation day so he could arrive by 9 a.m.
"It's always been a big part of my life and also because for this episode in particular, we're finally going to see what Luke (Skywalker) does and what color his light saber is going to be. So I've got to make sure I'm ready for that,” Enriquez said. 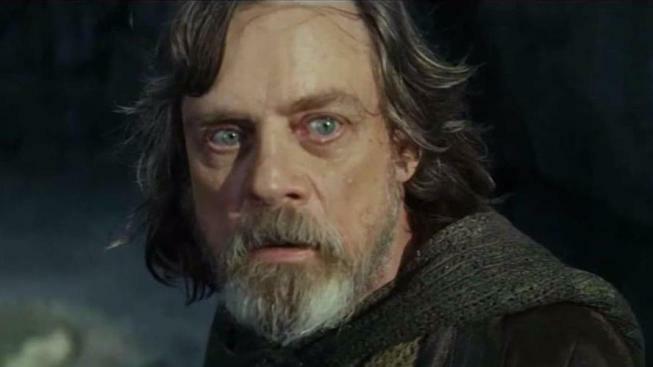 The color of his light saber will reveal whether Luke is still good or turns bad. “Really hoping it's the green one from Episode 6, but if it turns red, I will cry very, very, very loudly,” Enriquez said. Several fans turned out in costume. "Being in an X-wing suit is something I've wanted since I was 5 years old,” said Erik Perez of Modesto. “So being able to come out here, do that, and see the movie is a dream come true." The true Jedi may be the projectionist at the Tech Museum in San Jose. It’s screening the movie with 70 millimeter IMAX film. They say it's one of 11 reels in that format in the world, and the only one on the West Coast. "It came in in 45 different reels,” said Michelle Duncan, the Tech Museum’s theater director. “He spent 12 hours putting it together and screening it to make sure it was ready for our audiences tonight."